A Multitude of Morgans – One From Every Year It Was Struck! 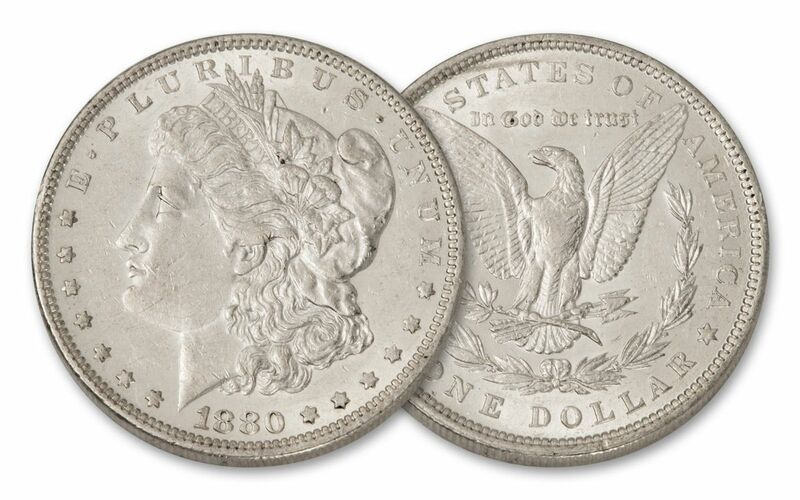 The Morgan Silver Dollar is one of the most widely collected silver coins in the world. It is the Silver Dollar of the American Wild West, the First World War and countless American achievements and innovations. Struck from 1878 until 1904, and again for a single year in 1921, the Morgan Silver Dollar contains 90% fine America silver mined from the famous Comstock Lode. Each of these U.S. Silver Dollars is an authentic piece of American history. Unfortunately, millions have been either worn down in commerce or melted for their precious silver. The Pittman Act of 1918, for example, authorized the melting of up to 350 million Silver Dollars. It’s estimated that a scant 15% of all Morgans struck still exist in any condition today. 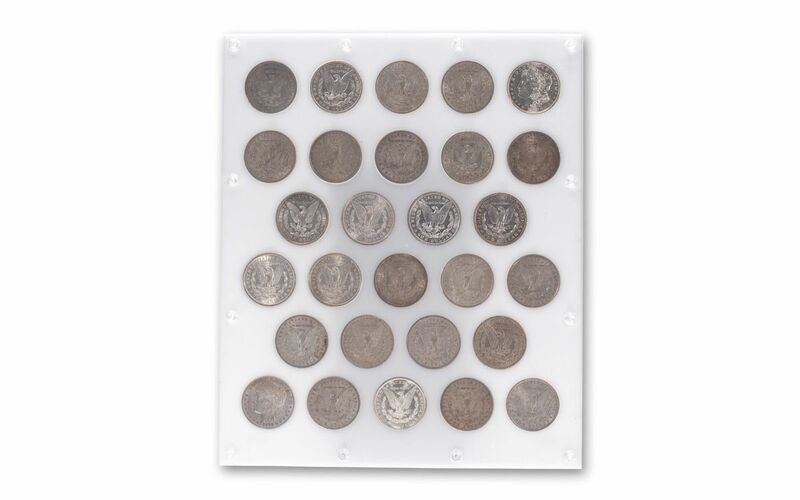 This fantastic 28-coin collection brings together one Morgan Silver Dollar from every year of production, from 1878 to 1921. That includes the highly sought-after turn-of-the-century 1900 Morgan, the tough-to-find 1895 issue, the last-year 1921-D Morgan (the only Morgan struck at the Denver Mint) and the coveted first-year 1878-CC Morgan struck in Carson City. Every coin comes in Extremely Fine (XF) to Brilliant Uncirculated (BU) condition, housed together in a white plastic holder that will keep your coins protected for generations. There’s no telling what sort of adventures these coins enjoyed before arriving in our vaults – long days on the Western trails, being offered up in card games or held as a good luck token on the battlefields of Europe. But no matter where they’ve been, each coin still has one more adventure to go – as part of your collection! Tracking all of these coins down was no easy task, and there’s no telling when our limited supply will run out. 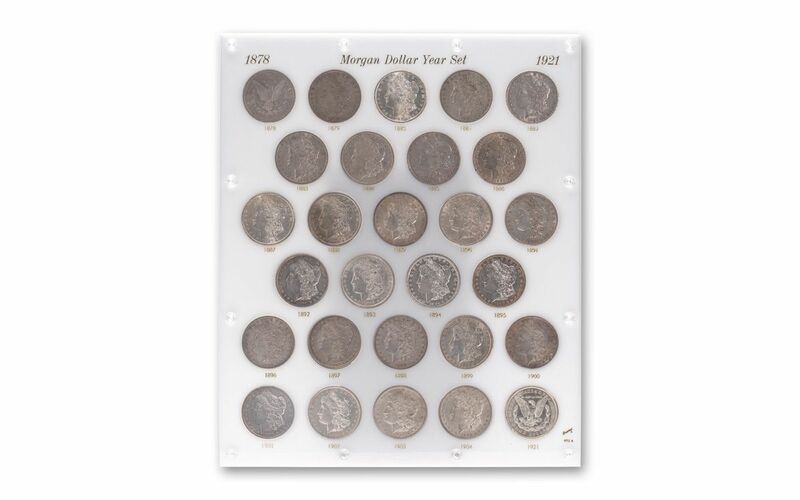 Own a full set of Morgan Silver Dollars and order yours today! Mint marks and grades vary. AMERICA’S MOST POPULAR COIN – The Morgan Silver Dollar – so named for its designer, U.S. Mint Assistant Engraver George T. Morgan – has stood the test of time. Struck from 1878-1904 and again in 1921, it was the coin of America’s “Wild West” and jingled in the coin purses of gamblers, gunfighters, soldiers and dance hall girls. A COMPLETE YEAR DATE MORGAN COLLECTION – This 28-coin collection includes a Morgan Silver Dollar from every year the coin was minted 1878-1904 and again in 1921. CLASSIC DESIGNS – Morgan’s historic design depicts a profile of Lady Liberty on the obverse while the reverse features an eagle with outstretched wings. The model used for Liberty was Miss Anna Williams of Philadelphia, who Morgan declared to have the most perfect feminine profile he had ever seen. STRUCK IN GLEAMING AMERICAN SILVER – Struck in 26.73 grams of 90% silver from the famous Comstock Lode, the Morgan Silver Dollar is a big coin 38.1 mm in diameter. When this coin was plunked down on a counter, its weight meant real money, pure and simple. EXTREMELY FINE TO BRILLIANT UNCIRCULATED CONDITION – These coins will come graded as being in Extremely Fine (XF) to Brilliant Uncirculated (BU) condition, remarkable considering their age and use in circulation. 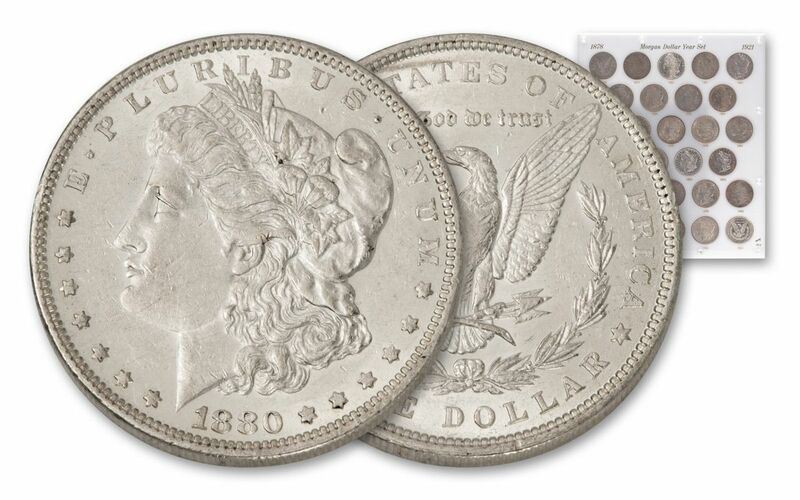 THE CASE OF THE DISAPPEARING MORGANS – While millions of Morgan Silver Dollars were struck from 1878 through 1921, massive silver meltings and the ravages of time have taken their toll. Today coin experts believe that only 15% of all Morgans ever struck remain in existence! Don’t miss your chance to get a complete year-date series of Morgan Silver Dollars with this 28-coin set. Get your collection MORGAN-ize your collection by clicking one to your cart today!